Natalie: I have now visited twice the Grotte de la Sainte Baume, which is a cave in the south of France where it is said that Mary Magdalene spent much of her time after the Crucifixion, Resurrection and Ascension of Jesus. The cave is on the side of a mountain, and it takes about a 45 mins steep walk through glorious and luscious woodland to reach this sacred place. Before entering the cave, I began to communicate with Mary Magdalene to discover the purpose of my visit and why I was being guided to visit the Grotto. After my second visit, I received new and updated wisdom from Mary Magdalene which I felt needed to be shared once more with anyone who was willing to receive. 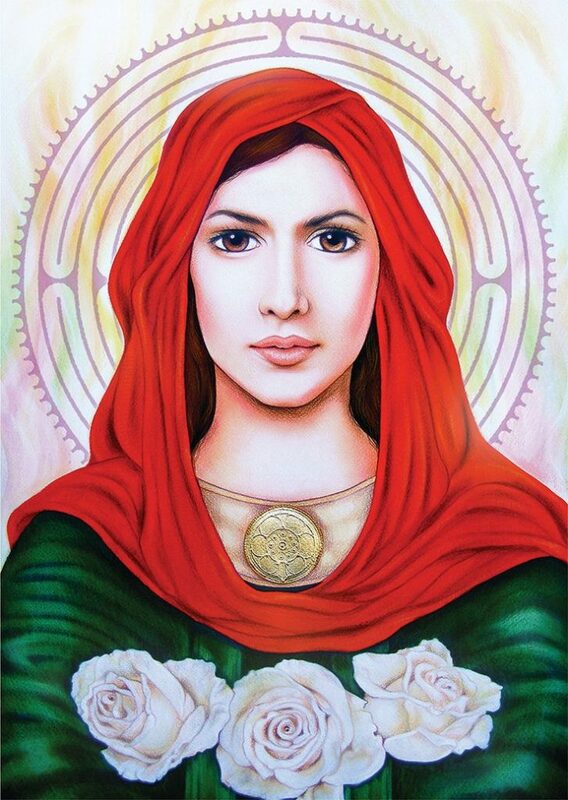 Mary Magdalene: It is an honour to connect with you, and I shower you in the vibrations of the Divine Goddess and Goddess Isis. Even as a child I wore the symbol of the Golden Serpent. A symbol of being initiated into the teachings of the Divine Feminine and Goddess Isis. I was and remain a High Priestess of Goddess Isis Order dedicated to the power, magic, and love of the purest form of the sacred Goddess. While we honoured and embodied the Cosmic Goddess, we also cultivated the balance of the Divine Masculine and Divine Feminine within our beings, recognising this sacred union as our truth and creative power. I, Mary Magdalene was initiated into Magdalenes which furthered my spiritual development and harnessed my understanding and experience of the Christ Consciousness, an active, healing and creative energy of the Universe of the Creator. Each stage of my childhood was dedicated to my union with the Creator and discovering how I may be of service by following the murmurs of guidance within me. It was my training which paved my way to my union with Jesus as well as preparing me to continue the teachings shared with both of us, after his ascension. The teachings Jesus shared were born from love and given in love, they represented the union of the masculine and feminine vibrations of the Creator in harmony and oneness, awakening the same within all. His teachings drawn from the knowledge we had gained, understood and discovered through our childhood, and yet Jesus had a way of sharing the energies and wisdom we were accustomed to in a new light as if rebirthing and advancing the wisdom so all could understand and embody. He was truly being divinely inspired, he enabled all to access purer, higher vibrations of light. During the times when Jesus shared his teachings, I would also receive the same downloads of energy and inspiration. As a representative of the Divine Feminine, I acted as an anchor, grounding the sacred energy into the Earth and consciousness of humanity. It was after the ascension of Jesus that I was guided to continue to share with others the detailed teachings and healing practices I had received. One of my greatest purposes at that time was to share my wisdom with the Goddess Isis Order, Magdalenes and Christ followers further afield in the neighbouring countries and beyond. We knew we had friends far and wide who we had not met yet, and that they were waiting to receive the energy and wisdom Jesus and our community had anchored. My mission was to preserve the teachings for generations to come. The divine directions and tasks given to me by the Creator seemed endless at that time. I was to develop the presence of the Goddess and remind many of the merge of the Divine Masculine and Feminine within them to nurture the world, as well as healing some devastation which occurred in humanity due to misunderstanding when Jesus left the Earth. I was to distribute energetic codes, templates, and healing as well as physical scrolls, objects, tools and crystals of spiritual value in certain sacred places across the world. My purpose was to support the preservation and continuation of the healing and awakening Jesus had begun. I didn’t do this alone as most of our sacred community who enveloped Jesus and I through his ascension, travelled with me; men, women, children and even some of our animals. Jesus himself was there at times in his energy body offering words of wisdom and insights to encourage us. I had another very beautiful role, a role which everyday healed my heartbreak of physically losing Jesus, even though I understood the truth of the matter. This role encouraged me to be determined to achieve the tasks given to me by the Divine Creator while also filling my days with fun, love, and laughter. In my opinion, it is the most sacred role of a woman, I was given the gift of being a mother. Sar’h was the creation of the Divine Creator to embody my energies as Mary Magdalene and Jesus’ sacred vibrations; she really was the image of our union in more ways than seemed possible. A sacred gift to the Earth and me. She carried many names, the Golden Chalice, the Holy Grail, the Grail Treasure, the Golden Serpent and the Union of the Divine in Manifestation, to name a few. Sar’h was already born when Jesus moved through the crucifixion and resurrection initiation. As I began my travels I was pregnant with our second child who was to be born in France and named Maya. Our purpose when arriving in the South of France was to begin the process of distributing the many sacred energetic and physical scrolls, tools and templates which had been placed in our possession. These were to be given to specific people and hidden in certain places to preserve their safety. We were greeted and supported by the members of a Goddess Isis Temple and Order dedicated to the Divine Feminine. These women and men of such profound inner beauty supported our mission, as well as creating a sanctuary for Maya to be born into the light of the Divine Goddess. Later the Isis Order lead us to a space of safety near their temple. Our shelter was a cave in the South of France known now as the Grotte de la St Baume. This shelter was needed to ensure the safety of Sar’h and Maya, both energetically and physically. We also wished to educate them in our teachings as they would distribute in their adult years what we had begun with Jesus. There was a need for us to be sheltered away from the outside world as Sar’h was immensely sensitive, she held and radiated such pure Christ Consciousness and yet as a child could easily absorb the energies others emanated. If these energies were of a lower vibration, Sar’h would become sick very quickly. She needed to be constantly surrounded by the light and those who could master their thoughts and clear their energies. This way she could learn to protect herself while sharing the purity within her being. There were also those who had heard of Sar’h and Maya and wished to sabotage our work and mission of distributing the light and love of the Creator. Natalie: During my time in the cave the presence of Mary Magdalene was very strong even though this area like a church now has been overseen for many years by monks. The Divine Feminine vibrations still remained within its energy. As Mary Magdalene appeared in my third eye before me, it was Sar’h whom she pushed forth to me. Sar’h seemed to me to be about twelve years old when Mary Magdalene was bringing her into my awareness. Mary Magdalene wanted Sar’h to share some of her insights into her life in the cave. I had never consciously met Sar’h before, so it was a new experience for me. Sar’h shared some visions with me. The first being a procession of women, men and children dressed in white wearing the mark of the golden serpent walking up through the woodland to the cave. Sar’h told me that they came to visit them in the cave every day bringing food and anything they needed. She said she enjoyed their visits as some of the initiates of the Goddess Isis Temple were of similar age to her or even younger, so she had time to talk and play with them before the daily ceremony lead by Mary Magdalene. She told me how she loved running through the woodland with her friends and sister, like her they did not really know what the outside world was like, however, they enjoyed sharing stories of their inner plane experiences. Sar’h shared that she also enjoyed the daily ceremony held within the cave as it allowed her to see her mother at work, the power, grace and wisdom she exuded. During their stay at the cave, the Isis Order would conduct all their ceremonies and initiations within the cave. The second vision Sar’h shared with me was of herself and Maya during night time embraced in their mother’s arms within the cave as Mary Magdalene shared her memories of Jesus. She would ask her mother to share everything she knew about her father from his birth to his ascension. Sar’h said she loved these times the most as sometimes in those intimate moments of sharing with her mother and sister, her father would appear as an energetic form in the cave to share some time with them. Sar’h told me that she enjoyed living in the cave as she had everything she needed, and they moved from the physical planes to the inner planes of the Creator’s Universe very easily. I believe Mary Magdalene’s sharing of Jesus’ lifetime with Sar’h and Maya was her way of guiding her daughters through their initiations and preparing them for their adult life. Mary Magdalene: As Sar’h reached the age of fifteen years old, I knew it was time to support Sar’h in the next stage of her life. I had known from the moment we arrived at the cave that we would leave the safety of the cave and travel to a sacred Druid community in England when Sar’h became of age. Our destination is now known as Glastonbury. I knew her purpose was to marry and remain with the Druid Community. This made our journey to England exciting as I knew a new life awaited Sar’h, while also being heartbreaking as I knew I would eventually, once she was settled and we had travelled some of the area, be making the journey back to France without her. It was not long before Sar’h was in love and married to a soul who was deeply familiar to her, a soul she had journeyed with many lifetimes together. They had many children and a very blissful life. Sar’h took on the role of sharing the teachings of love passed down to her from her father and me. Her healing powers were breathtakingly beautiful. Sar’h spent around fifty years in Glastonbury. At the age of sixty-eight, she journeyed to Scotland where she lived for the remained of her life passing over when she was nearly a hundred years old. I, Mary Magdalene, continued to care for Maya while in the Druid community in England until she became of age. Maya was such a strong fiery character, she had the ability to gift the most advanced spiritual teachings to another in the simplest way, so they would understand completely, experiencing beautiful inner transitions. She had a lovely way of communicating with people and was almost fearless in her approach to life and ascension. She was determined and continued the work her father had begun. I, Mary Magdalene returned to the South of France and lived out my days within the temple of Goddess Isis with the Isis Order who had cared for Sar’h, Maya and I for many years. I no longer needed to live in the cave to protect my daughters and ensure their safety, so I enjoyed my time surrounded by the beautiful souls of the temple. I visited the cave now and then when I felt that Jesus wanted to appear to me and share some time with me. I travelled a little around France and Europe. However, I had completed my tasks given to me by the Divine Creator, so I was able to spend much time in peace and solitude, sometimes reliving my memories, other times in deep communion with the Creator. I ascended leaving my body behind when I was over the age of one hundred and entered into an energetic body which allowed me to more easily move between the earthly and spiritual planes. I wanted to share the truth of my journey after the ascension of Jesus, so we may connect on a deeper level, and so you may further access the truth of my being and soul.